Now known as the Florentine, this building was designed as a “mammoth wholesale block” in 1909 by architects Lohman and Place and built by contractor, David Dow. The building dates from a time of explosive economic and physical growth for the original commercial district, which expanded with, in particular, the construction of many well-designed warehouse buildings. 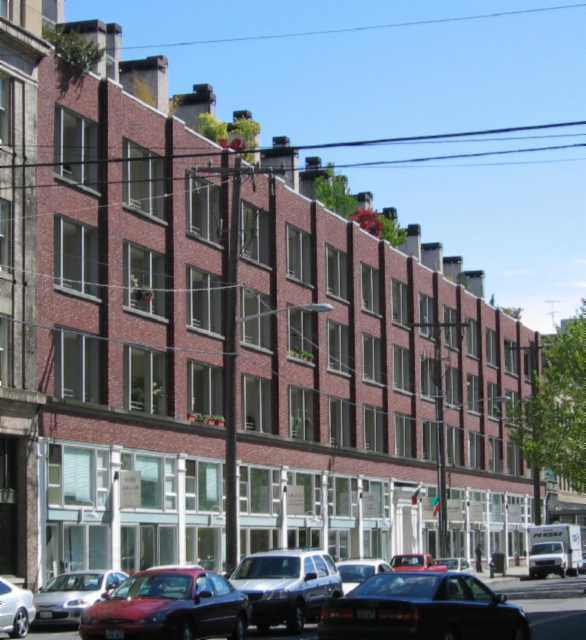 The Seattle Security Company, who commissioned the building, had previously developed property in the district. The structure was planned to be three stories taller than built and was promoted as the largest wholesale building in the district. It was located immediately adjacent to the freight yards and for a time, conveniently next to a rail spur for easy shipping and receiving. The rail spur was in the location of the former Kaufman Warehouse Building (at 538 First Ave S), apparently completed the following year. The Seattle Security Company Building also included modern steel rolling shutters at the delivery bays on the east elevation, as well as ten freight elevators. Architects Lohman and Place are relatively obscure, although they are believed to have designed industrial projects around Lake Union. David Dow was a prominent contractor and Seattle citizen between the 1890s and his death in the 1920s. He is described in Clarence Bagley’s History of King County and came from a family of well-known Seattle contractors, which included his sons, Andrew and Dwight, as well as his brother Matthew. He also built the warehouse at 548 First Avenue South, in addition to buildings all over Seattle. This is a four story building, with exterior walls clad in brick and a flat roof. It is rectangular in plan with a footprint of 150 feet by 290 feet. The main, 290 foot west façade along First Avenue South, (as well as the east façade), is divided into fourteen bays. The ground level consists of a series of storefronts, with very high transom windows, corresponding to a mezzanine level. The storefront bays are separated by thin cast-iron columns with simple capitals. The top three floors consist of corresponding bays, clad in brick in a Flemish Bond pattern, and separated by piers. Former window openings are trabeated and have been left intact. In a fairly recent remodel, at the top three floors, however, a new exterior west wall of what are now apartment units has been set inside the original exterior wall and behind the extant trabeated openings, creating a series of enclosed loggias. At the time of initial construction, no cornice was installed, because the building was designed to allow a three story addition. The recent remodel of the building into a condominium with apartment units has kept the western storefronts and the general sense of the top floors, including the trabeated openings. Historic photos reveal that the transoms of the west elevation storefront had prism lights, which are no longer extant. They also show the typical window configuration, which included a central pivoting window, flanked by a double-hung window to each side. The most major changes, however, have occurred behind the original exterior west façade. A penthouse level, mostly not visible from the street, has also been added. King County Tax Assessor Records, ca. 1932-1972. Bagley, Clarence. History of King County. Chicago-Seattle: S. J. Clarke Publishing Company, 1929. Krafft, Katheryn Hills. “Pioneer Square – Skid Road Historic District (Boundary Increase),” submitted 15 December 1987 and approved 6 May 1988. City of Seattle, Department of Planning and Development, Microfiche Library.